Boomstand is a sound system for public space. We install pop-up sound systems in public spaces for anyone to play music through and for musicians, poets, and artists to perform without lugging around a PA system, lowering the barrier to public performance. 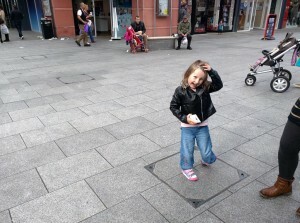 We create a happy medium between people who want to perform in public space and the obligations of local councils. It’s still in the early stages but is evolving at a pace, improving the system with every deployment. The first outing was during the Full of Noises 2015 festival in Barrow-in-Furness. 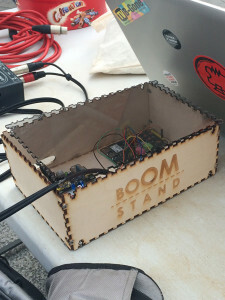 Octopus Collective – who run FON and are based in a park in Barrow – have access to a bandstand.Engaging park visitors, we had a fully operational hardware and software stack, but encouraging people to share their music was a little bit more challenging than we expected. 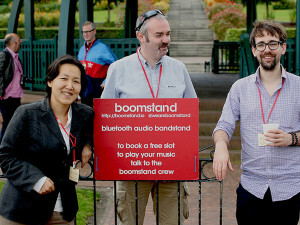 Friend of Boomstand Ross Dalziel wrote an in-depth review of that day. While Brett acted as the mediator between the Boomstand box and punters, using raffle tickets to pair to the Boomstand bluetooth, I went up to people under the sound canopy to ask if they would be interested in playing their tunes through the 5.1 surround sound system. Despite the clear day guaranteeing us favourable footfall, most people were busy shopping, talking with friends, drinking coffee or going about their normal routines. A quick unscientific analysis of the people I engaged with led me to conclude that there was a very high proportion of people in Workington who had recently upgraded phones and haven’t migrated their music yet OR didn’t think other people would share their taste in music. This was often conveyed with a certain smugness. However, when it worked – it was joyous. I couldn’t help but groove along to the little girl who started jumping up and down and dancing when her mum streamed her favourite song. There was the Czech man who really wanted try it but didn’t have any music, so played the default Samsung theme from his phone. He later came back with a request so I lent him a phone to stream Oasis. 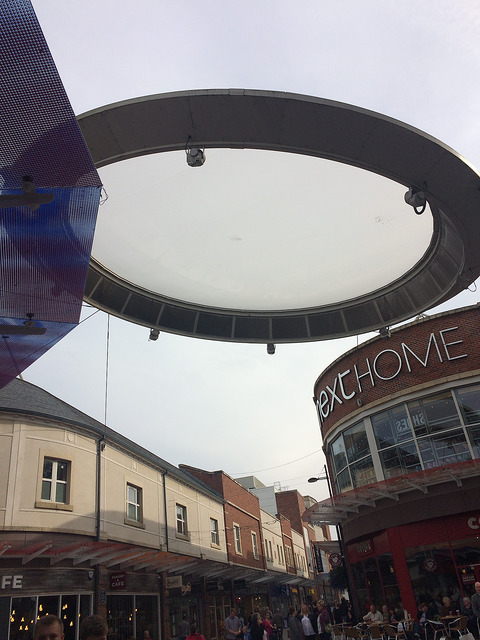 The space under The Hub is ideal for engaging with the public, and the thought that in only 5 minutes (the slots we allocated per person) it was possible to reclaim ownership of public commercial space came through with the few people who were brave enough to give it a go. 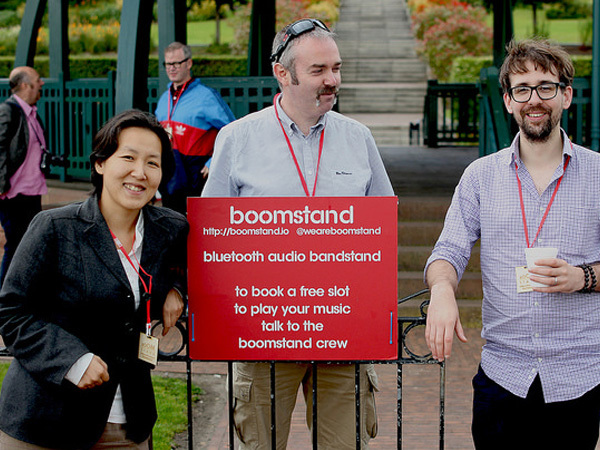 Boomstand was conceived during the Bring & Byte (May 2015) music & technology hack weekend produced by ::theHub (no relation to The Hub). The rough and ready team (Adrian McEwen, Brett Lampereur, Craig Pennington, Joey Baxter, myself) who gravitated towards solving the issue of improving public music sharing beyond mere teenagers on buses listening to techno on tinny speakers. We worked over the weekend to prototype a micro-controller that would make it possible to stream music over bluetooth to more suitable sound systems. See the video of the weekend below where it all started.